Yesterday was grey and dull, and today was all that plus wet! Despite the weather, we pulled into the town of Newtown and made for the Barbour Living Heritage Village for a history lesson. 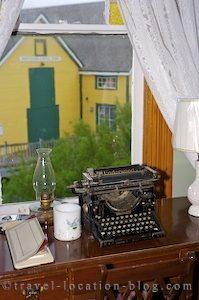 The Barbour Living Heritage Village is based around the lives of the Barbour family, a prominent merchant family involved in the sealing and fishing industries in the late 1800's. The village features two heritage homes, one which was built for Captain Benjamin Barbour and his family in 1875, and the other was built in the early 1900's (in a Queen Anne Revival style) for one of Benjamin Barbour's grandsons Captain Alphaeus Barbour. Along with the original homes of the Barbour's, there's a school house, fishing stage, and Provisions and Retail Store. The Interpretation Centre in the village explains the fishing and sealing history of the family as well as featuring a replica of the schooner Neptune II (about 2/3's the size of the original) which was owned by the Barbour's. On November 29, 1929 the Neptune II, almost within sight of home after sailing from St John's, was caught in a severe hurricane force storm which disabled the vessel. Adrift at sea, the schooner and crew were blown clean across the Atlantic Ocean and ended up in Tobermory, Scotland. The Barbour Living Heritage Village is well worth a visit, and costs only $7 per person to enter the premises with a costumed interpreter who can explain the role of the Barbour family in the community and fishing/sealing industry. We continued on our way along the Road to the Shore (Highway 320) and drove on to the Terra Nova National Park for a brief stop, however the weather was pretty nasty by that time and we soon made a beeline for the town of Bonavista on (you guessed it) Bonavista Peninsula along the Discovery Trail. We found the internet cafe and checked our emails before heading out to the Elliston Campground to turn in early. However, we were in for a little surprise.....in the form of the Bird Island Puffin Festival - an annual event held at the campground! Initially, we looked around at the clientele of the festival and decided that given the average age of say 13 it was likely to be soon winding down for the day, so were not too concerned and in fact decided to pay the entrance fee to look around. Armed with a program of events we started wandering through the stalls which were fairly sparse but entertaining nonetheless and there was a two piece band playing that had attracted a decent crowd. We were quite happy until Rolf found further information on the program - there was to be a Peninsula Idol until around 10:30pm then further entertainment until 2:30am!! Sounds like a similar experience as our first night on the Rock (Living next door to Alice). Rolf tried in vain to sleep, while I settled on reading a book until 2:30am which by then I could hardly keep my eyes open ... but the show went on!! By around 3am it was finally winding down and we finally got some sleep! A word to the wise ... go and enjoy the Puffin Festival but don't stay at the campground during the event if you value your sleep!